Now introducing the new manual e-Pipe clearomizer kit. 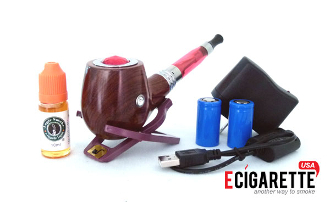 The e Pipe(pipe bowl) made of real wood and using a 510 threaded it can work with the ce4 clearomizer and more models useing the same ego battery thread. This new model will work with the older 601 e-pipe batteries and chargers and you can charge the batteries right from the pipe bowl. It also comes with a USB charger, making it possible to charge your e-cigarettes from any electronic with a USB port such as your computer or using a usb home charger.